Child friendly? Recommended for ages 13 and up. Those who want their fair share of superheroes, war and science fiction will get exactly what they're itching for with Captain America: The First Avenger, the latest Marvel Comics-inspired flick to roll into theaters. Actor Chris Evans, who recently graduated from crash-and-burn films like Not Another Teen Movie and Fantastic Four, gets the opportunity to play a reputable superhero this time. 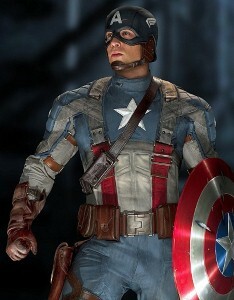 In the film, which takes place during World War II, Evans steals the screen in the role of Steve Rogers, a young man who volunteers to take part in an experiment that morphs him into the "Super Soldier." His decision eventually leads him to the ultimate nemesis – Red Skull. Awesome? Yes. Factual? Well, not so much. Of course, a comic book movie isn't expected to be true to history, but a bad guy armed with rayguns and other high-tech weapons during World War II – not to mention the fact that Red Skull looks like an alien who flew his ship too close to the sun – may be a little too over the top for some. The best part about the villain is that he's played by Hugo Weaving, the actor best known for his portrayal of the ruthless Agent Smith in The Matrix. Unfortunately, the gorgeous Hayley Atwell, in the role of British military officer Peggy Carter, was somewhat of an awkward addition to the film – she and Evans have about as much chemistry as preteens engaging in their first slow dance. Other supporting actors, however, make up for the film's lack of charm in the romance department, and it's always good to see Tommy Lee Jones, who takes on the badass role of Colonel Chester Phillips. Hokey special effects aside, if you enjoyed the 1990 film adaptation of Captain America, or the original comic book series, you'll likely rave about this new film. And, it's a great way to introduce your kids to a legendary super hero. Just don't expect Oscar-worthy performances and hearty subplots. Child Friendly? Captain America: The First Avenger tells the story of an underdog in the war effort who gets his chance to make a real difference and combat the worst of the worst. The film does manage to exceed typical comic book depictions and will likely excite the kids – at least for a few hours (if you're lucky). Recommended for ages 13 and up.